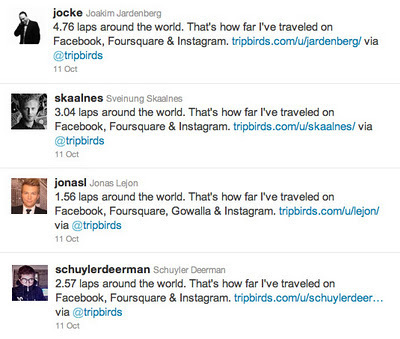 In the last few days you might have seen updates on Twitter on how many laps around the world people have traveled. These trip stats are based on peoples checkins and pictures from Facebook, Foursquare, Gowalla and Instagram. You can get your own stats through Tripbirds teaser page. As with all early releases, we found a few bugs in our initial code that resulted in some people's trips not being recorded correctly. 40 cups of coffee later, these issues should have been fixed. You might want to check out your trip stats again.